At work we are currently undergoing a production that involves the implementation of an reactive animalistic AI. The user can interact with the AI and should as much as possible appear to have a conscious of its own. We decided to implement an AI that bases its action on internal state values such as HUNGER, ENERGY, AFFECTION, FUN etc. I would like to share some knowledge of the process and some of the pitfalls we encountered when developing the AI, in hope to spark a discussion and perhaps enlighten other developers of different approaches. Naturally, we discussed a finite state machine, but based on previous experience they tend to become messy and hard to maintain. The primary reason is that each state requires a defined transition to another state. As the amount of states increases, the amount of transitions between the states increases and thus makes it difficult to scale. Depending on state machine design it can also become difficult to have the AI be in multiple states simultaneously, e.g. a “run-towards-the-ball” state and a “stop-up-and-sneeze” state. During our initial investigation, we were intrigued by the way, various machine learning algorithms tackled AI. We played around with Unity’s machine learning agents and we got inspired to develop a similar approach that didn’t involve machine learning. We did not use machine learning as it seems like ‘BLACK MAGIC’ and we were afraid of ending up in a pit we could not escape. Instead, we implemented an AI that decides which actions to perform by calculating a decision score that is primarily driven by the internal state values. States, internal floating-point values, ranging from 0 to 1 that represents HUNGER, ENERGY, FUN etc. Controllers, offers control of various systems of the AI e.g. a head controller, walk controller, tail controller etc. I won’t go into details, except for Actions which is the center piece of the AI. Each action then receives a decision score function that calculates a decision score. These values could represent the AI’s internal state at any given time. In this situation we could intepret it as the AI is equally hungry and entertained, but it could really use some Love <3. If we iterate over all actions, and the highest scoring actions have first priority of occupying a controller, the result would be. So even though “Whack-tail-furiously” received the lowest score among all the action, it still ends up being executed because all the controllers for it to execute was still not occupied. For us, this mean we can run multiple actions in parallel, as long as all the controllers are available for that given action. This approach gives us great flexibility and gives us great power when it comes to transitioning from one state to another as well as running multiple actions in parallel. However, there are also some serious pitfalls that has to be considered before you dive into this approach. Selecting the correct score function is very difficult. Especially if you attempt to tailor a specific experience such as running a sequence of actions. In some cases, you will have to add or subtract some weights to the score functions in order to get the desired behavior. If you are comfortable with machine learning you could attempt using machine learning to do the workload of establishing the score functions. You need some good debugging tools to debug this system. It is too easy to make a mistake when designing the decision score and what controllers they depend on. It is difficult to narrow down the exact issue, so creating good debugging tools is a life saver. 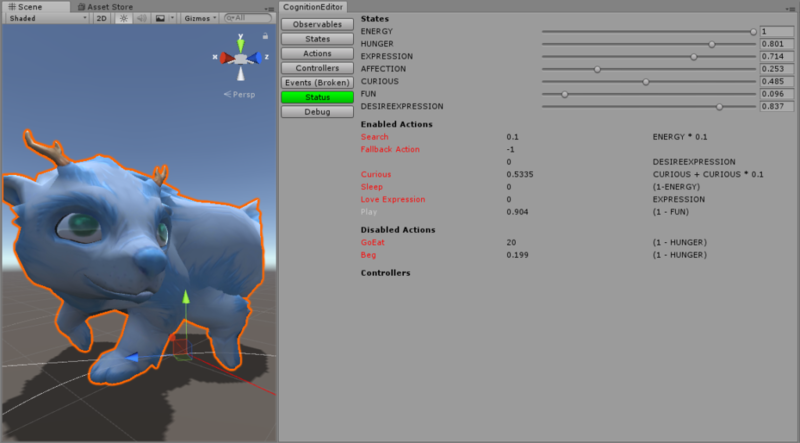 Using Unity, we ended up creating our own editor tools that displays all actions, what actions they depend on, what scores they got and so forth. Our AI editor tool. Don’t look to closely on the decision score next to the action name. They don’t reflect the score function (to the right) because I have added some arbitrary weights in the code. But you properly get the gist of it. Thank you Alexander and Mads for providing feedback! 🙂 This is one of my very first technical blog posts. I would very much like your insights and critique both regarding our design as well as my writing. I am planning on creating more technical content like this in the future. « Ori and the Blind Forest – What could be improved?